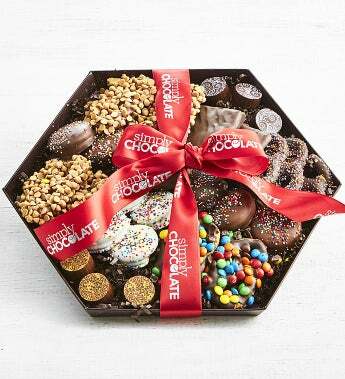 Simply Chocolate presents a delightful assortment of dipped delights. Enjoy chocolate covered pretzels, graham crackers, Oreos and marshmallows in an assortment of Belgian milk, dark, and white chocolate. This tray will sweeten any celebration. It's a most appreciated gift and centerpiece for any party.